ArcGIS and the Spatial Analyst extension helped determine variables attributed to the complex environments of coasts. ArcGIS for Server provided the full package of solutions for maximum performance, usability, and design. Local governments and decision makers often have only limited access to the critical information necessary to support choices for managing social and economic vulnerability and, specifically, to understanding the role natural habitat can play in reducing risk. As a consequence, they are unable to comprehensively integrate coastal hazard risk and sea level rise into their decision making in order to increase the resilience of human and natural communities. Until recently, the idea of mapping sea level rise based on emission scenarios from the Intergovernmental Panel on Climate Change was novel in the United States, and proposing to combine these with storm surge models was more novel still. Enter Coastal Resilience, an approach to assess risk and vulnerability while identifying restoration and adaptation choices, the backbone of which is an online mapping decision support tool. The approach and tool began in 2008 on the southern shores of Suffolk County, Long Island, in New York. The hypothesis at the time was that despite awareness of growing coastal hazards, local governments and decision makers do not have the capacity to map and plan for future climate projections, let alone identify coastal management scenarios to address these threats. Strengthened by Esri campus-wide site licenses and Esri Conservation Program grants where appropriate, the Coastal Resilience decision support tool has evolved over this time under the aegis of The Nature Conservancy (TNC); the University of Southern Mississippi; Esri Silver Tier Partner Azavea of Philadelphia, Pennsylvania; Ebert GeoSpatial; and the University of California at Santa Cruz. Between these organizations and universities, in addition to the Association of State Floodplain Managers, the National Oceanic and Atmospheric Administration’s Digital Coast partnership, the Natural Capital Project, and US Geological Survey (USGS), the Coastal Resilience decision support tool is well positioned to support a vast array of local and regional governments and institutions that are either responding to disasters or preparing and planning for current and future climate conditions. Web map of New York and Connecticut, focused on the southern tip of Manhattan. 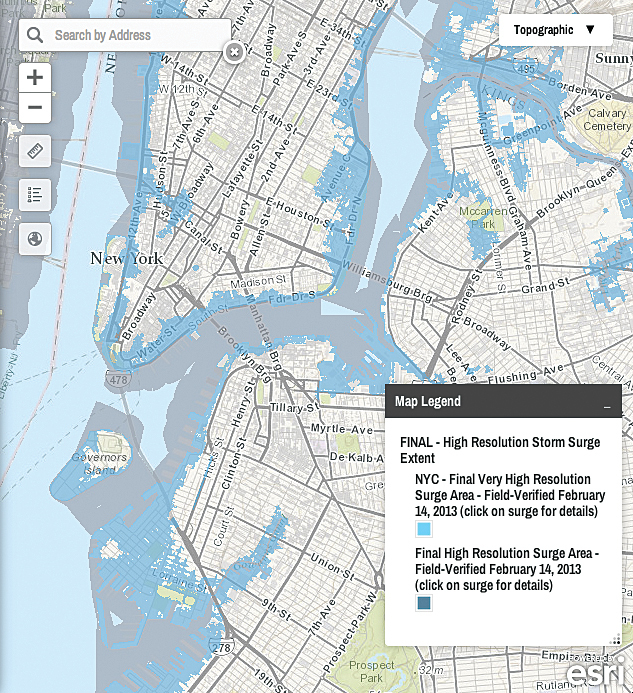 This compares a modeled storm surge scenario on the left (category 2 storm with darker blue representing highest mapping confidence of inundation) with the Federal Emergency Management Agency’s (FEMA) final surge area from Hurricane Sandy on the right. 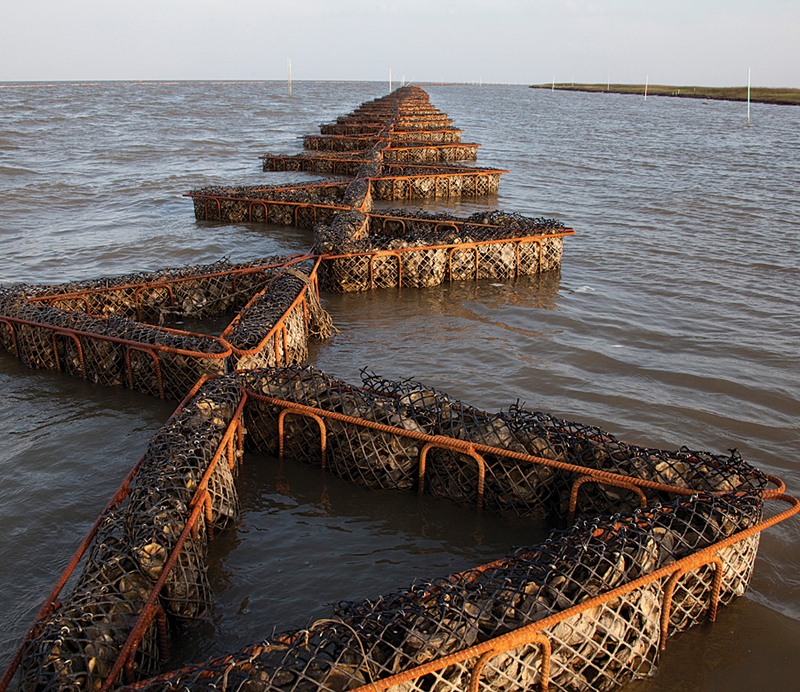 Just after the Deepwater Horizon oil spill in the Gulf of Mexico in April 2010, the Coastal Resilience team developed the Restoration Explorer, an application that allows stakeholders to examine ecological and socioeconomic factors for oyster reef restoration suitability. In this app, a suitability index was assembled using ArcGIS Spatial Analyst, a single raster surface of factors in every Gulf Coast state used for restoration scenario planning. The individual factors of the index can be interactively weighted for importance within the web app when identifying potential restoration sites. The oyster restoration decision support app was developed in the initial weeks after the spill to help with postdisaster planning and recovery. The application continues to be a central tool to support Restore Act legislation across the Gulf and specifically in coastal Alabama with a project called 100-1,000. This project is identifying the restoration of 100 miles of oyster reef that will protect and promote the growth of 1,000 acres of tidal wetlands in Mobile Bay. Restoration at this scale requires tools that look at the entire social-ecological system of the bay, evaluating the most suitable places that meet multiple management objectives. Alabama oyster reef installed with booms. The success and deployment of the Restoration Explorer led to its replication, an essential component of the Esri technology solution stack, in another Coastal Resilience project site. The Habitat Explorer was created by replicating and modifying the Restoration Explorer in the days after Hurricane Sandy struck New York, New Jersey, and Connecticut in October 2012. 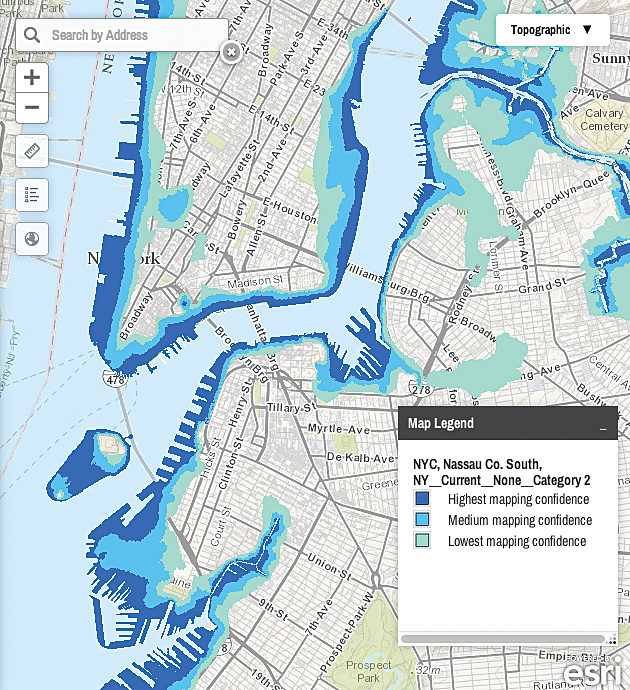 In part to help New York governor Andrew Cuomo’s 2100 Commission on long-term resilience of infrastructure, there was a need to know where tidal marshes may have the highest likelihood to protect coastal communities to inform where these marshes should be enhanced or conserved as part of the recovery process. The Habitat Explorer interactively identifies tidal marshes that potentially protect people, property, and infrastructure by weighting multiple variables, such as marsh size, infrastructure, critical facilities, and demographic information. Using ArcGIS Spatial Analyst and a series of coastal watershed delineation and adjacency functions in ArcToolbox, these variables were attributed to marsh complexes throughout coastal New York and Connecticut. This has led to numerous engagements where TNC and local governments are examining tidal marshes’ ability both to reduce the vulnerability of coastal communities as well as to protect their long-term economic, social, and cultural health. Coastal Defense quantifies how natural habitats (oyster and coral reefs, tidal marshes, seagrass beds) protect coastal areas by reducing wave-induced erosion and inundation. It uses standard engineering techniques to help users estimate how and where to restore or conserve critical habitat and increase the resilience of a coastal community and its infrastructure. This and other infographics accompany the Coastal Resilience apps to illustrate their intended use. Based on Natural Capital Project’s marine Integrated Valuation of Environmental Services and Tradeoffs (InVEST) toolkit, the coastal protection model calculates an ecosystem’s ability to reduce wave height and energy, thereby lowering the risk of inundation and coastal erosion. The app is called Coastal Defense, a tool for examining how natural coastal habitats, such as oyster reefs, tidal marshes, and seagrass beds, help protect coastal areas by attenuating waves. The tool uses standard engineering techniques to help users estimate how and where to restore or conserve critical habitat to reduce wave impacts and increase the resilience of the coastal community. Deployed on tidal marshes in Puget Sound, Washington, and on oyster reefs in the Gulf of Mexico, the geoprocessing app utilizes Python when users select site-specific transects that then return the amount of attenuation provided by these habitats as waves run through them. The app supports coastal watershed planning processes in Puget Sound diking districts where “gray” (dikes) and “green” (marshes) infrastructure choices are being discussed with the goal of reducing the risk of flooding while retaining maximum ecological health. It is also being deployed in select Gulf of Mexico bays (i.e., Charlotte Harbor, Florida, and Mobile Bay, Alabama) in making the case for oyster reef restoration as a viable choice in reducing coastal erosion while increasing fishery benefits. In October 2013, Coastal Resilience 2.0 was launched. The Coastal Resilience tool is now available in 10 coastal states (Florida, Alabama, Mississippi, Louisiana, Texas, New York, Connecticut, New Jersey, California, Washington), Latin America (Mexico, Belize, Guatemala, Honduras), and in the Caribbean (Grenada, St. Vincent and the Grenadines, US Virgin Islands). There are also global and US national web maps that together form the Coastal Resilience network. These and other stories can be found at coastalresilience.org. For more information, contact coastalresilience@tnc.org.